Oddball Stocks: Seahawk Drilling, value in bankruptcy? Seahawk Drilling started out as a part of Pride International up until 2009 when Pride spun out the mat jackup rig business. The company for years drilled natural gas in shallow waters (under 300ft) in the Gulf of Mexico. The spinoff wasn't exactly wonderful, from the start Pride saddled Seahawk with a tax liability related to a dispute with the Mexican tax authorities to the tune of $300m+. In addition at the time of the spinoff Seahawk had a majority of its rigs engaged with Pemex for which the contract ran out shortly after the spin. Coming into the Spring of 2010 Seahawk had a fleet of 20 rigs of which 10 were cold stacked (stored long term), two contracted, and eight operating. The company was cash flow positive and things were looking up going into the Spring drilling season. All this was disrupted with the BP Macondo disaster when the US government put a halt on all drilling until safety could be ensured. Eventually the ban was lifted for shallow water in name only, while there was no official ban the government wasn't handing out the drilling permits lessees needed to drill. This left Seahawk in an interesting position, they had a lot of cash, a fleet of rigs and the hope that drilling would resume soon. This is where the value investors entered, at the time Seahawk was selling for far less than the value of the cash plus the scrap value of the rigs. The theory was the company could liquidate and would offer a nice return to investors. This wasn't just the theory of a few deep value guys on the internet, this was how the CEO was selling his company during investor presentations. On the old Seahawk website there was a great PowerPoint slide showing how the market was valuing Seahawk's rigs at $6m apiece whereas the scrap value was closer to $12m apiece. This appeared to be a classic net-net type of situation, or maybe a Third Avenue Value super net-net. So what went wrong? Over the next few months Seahawk languished losing money attempting to wait out the government drilling permit ban. The company was able to limp along from the Summer of 2010 to February 11th 2011 at which point they declared bankruptcy. During this time the company began to investigate 'strategic alternatives' which mostly included putting the company up for sale. According to documents filed during their bankruptcy Seahawk received a good bid for the company, but at the last minute the bidder low balled, most likely because they smelled blood in the water. At this point Pride called on a portion of the spinoff tax agreement which required Seahawk to pay $40m immediately. Seahawk didn't have the money and was forced into bankruptcy. The bankruptcy was in a sense prepackaged, they sold off all of the drilling assets to Hercules Drilling in exchange for 22.3m shares of Hercules common in addition to enough cash to retire Seahawk's line of credit. The deal was valued at $105m at the time of the filing. As part of the bankruptcy the company declared they would be able to pay all creditors and hoped to have money left over to pay out the remains to equity holders. Management touted the bankruptcy as the best way to return value to shareholders. As a very quick aside the original deep value thesis actually held, Hercules bought the drilling rigs for $105m and have stated they intend to scrap 10 of the rigs for approx $10-12m apiece. The liquidate value is real, the flaw in the thesis was that Seahawk wasn't able to survive long enough to realize the value, in addition management was more interested in holding on and hoping for a positive outcome than returning value to shareholders. This fact has shaped my net-net investigation going forward, it's the big reason I search out positive cash flow in addition to asset safety. Seahawk had asset safety but the cash flow situation destroy any chances of full asset value being realized. 2) Bankruptcy filings are much more robust than SEC filings, the company usually needs to file a monthly cash flow statement as well as other statements. The original filing includes an excellent description of how Seahawk found themselves in bankruptcy. With all this background it's time to take a stab at putting a residual value on the assets of Seahawk. 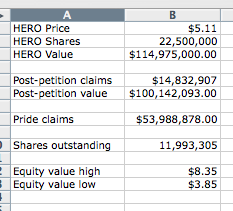 Valuing Seahawk is actually very simple, all that remains is an estate with 22.5m shares of HERO along with some residual cash. All an investor needs to do is figure out the amount of claims to be paid out, subtract them from the estate and divide the end result by the number of shares outstanding. A bankruptcy process is very fluid with things changing often, but enough is static that we can come up with a range of potential values. The first idea that needs to be understood is the difference between pre-petition claims and post-petition claims. Pre-petition claims are liabilities the company had coming into the bankruptcy. These claims could be accounts payable, lines of credit, payroll claims, amongst other items. Once a company declares bankruptcy all creditors (anyone who is owed anything by the debtor) has to file a petition with the court to recover the amount owed. The judge assigned to the case has to approve each petition claim for payout. While the short term liabilities look manageable it's the long term liabilities that are scary to an equity holder. The good news is that the biggest long term liability is an intercompany receivable for $354m, an account payable for the Mexican tax liability at the Mexican subsidiary of Seahawk. The good news is that US courts have precedent that foreign tax liabilities are unenforceable in the bankruptcy process rendering this claim worthless. The post petition liabilities are what matters, these are liabilities that have been approved to be paid out of the estate by the judge. The above view is clean and with some simple math we can get the value of the common. If the judge rejects the Pride Category 2 claims equity holders could receive $8.34, but if the claims are allowed the value equity holders recover will be around $3.85. The judge could also approve some portion of the claims and not all of them giving a value somewhere in the middle. The second variable to this picture is the value of HERO stock, not too long ago HERO was trading at almost $7 which would have increased the recovery value. Note: Seahawk also has $14m in cash as an asset, I'm not including this in the recovery scenarios as I expect most of it to be exhausted by lawyer fees. Any left over could increase the recovery value as well. I'm not smart enough to know which way the judge will rule, but an investor who understands law could have an edge in this situation. If you do understand the details of this case please email me or leave a comment on this post. I haven't seen the PACER docs needed to keep up with this case but there is a possibility of fraudulent conveyance in the spin-off (was a fairness opinion issued?) and maybe the sale to Hercules. Is the tax liability an executory contract that can be rejected? It seems to be related to the spin-off and the Mexican subs of Seahawk? I'm not a lawyer but here is my understanding, there is no fraudulent conveyance alleged by Pride because the estate is able to pay out all petitioned liabilities including the full Pride liability. Pride has petitioned the court saying that there is enough money in the estate that the full claim should be allowed and settled. Pride seems fine with the sale to Hercules because it gives them a shot at 100% recovery. The issue is that Pride obtained a line of credit of around $53m to support their end of the tax liability obligation which was eliminated in bankruptcy. Pride is petitioning the court saying that Seahawk should be liable to pay back the line of credit. What's very murky here is where the actual liability lies, the tax issue was from when Seahawk was part of Pride and Seahawk is arguing that Pride should be responsible. The actual tax liability is gone and has no standing in court, it's the line of credit that Pride wants Seahawk to pay back. The recovery value essentially rests on if the Judge determines that Seahawk should be liable for debt that Pride took on. And the factor in that is the legality of the tax support agreement. Prides upper management, Sea Hawks upper management, one big fat joke. Pride, Sea Hawks & Hero upper management were all hand in gloves with each other cheated they wiped out the Seahawk's shareholder value. Be prepared to pay off some days soon !